Hi everyone, its Lesley again! 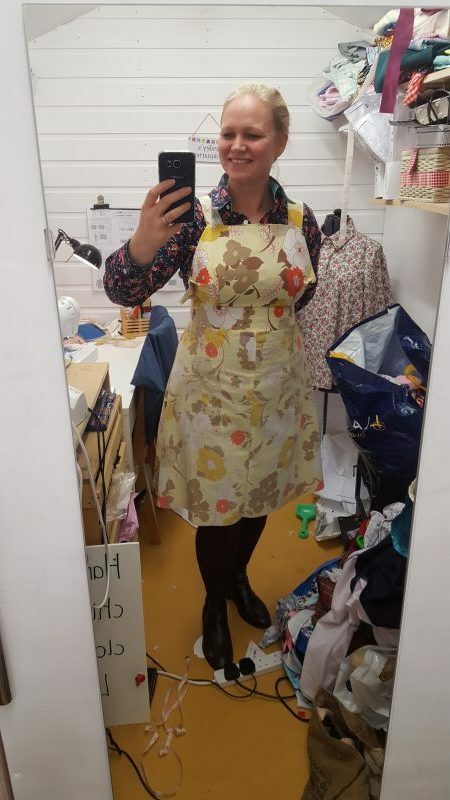 Has anyone else been watching all the lovely Tilly and the Button’s Cleo pinafore makes on social media? I think they look truly fabulous but I’ve never been tempted to make one myself because I just know it wouldn’t suit me. I need fitted dresses around my middle otherwise I just look even chunkier than normal. Every so often I go off piste and attempt a looser style and it just looks ridiculous and doesn’t get worn which is such a waste. And yet I really want a pinafore dress. Thankfully I found the Freja dress sewing pattern. It was a pattern developed by Simply Sewing magazine a couple of months ago. It’s an A-line skirt with a bib front and cross over back straps. 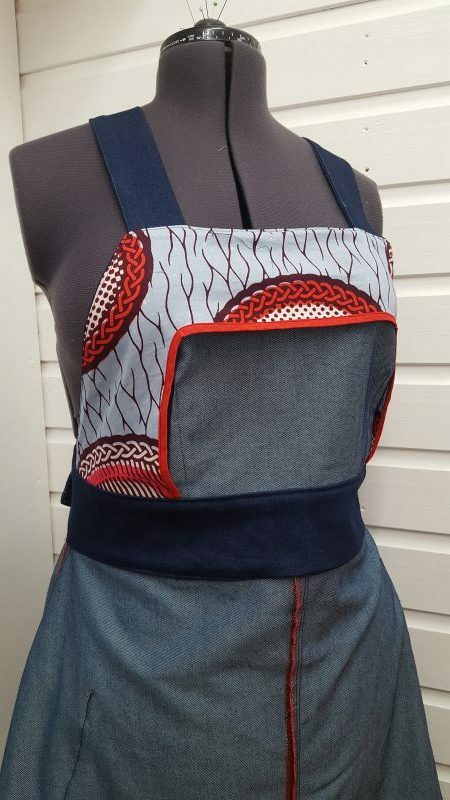 There aren’t dungaree clasps at the top as it fastens by buttons at the back. 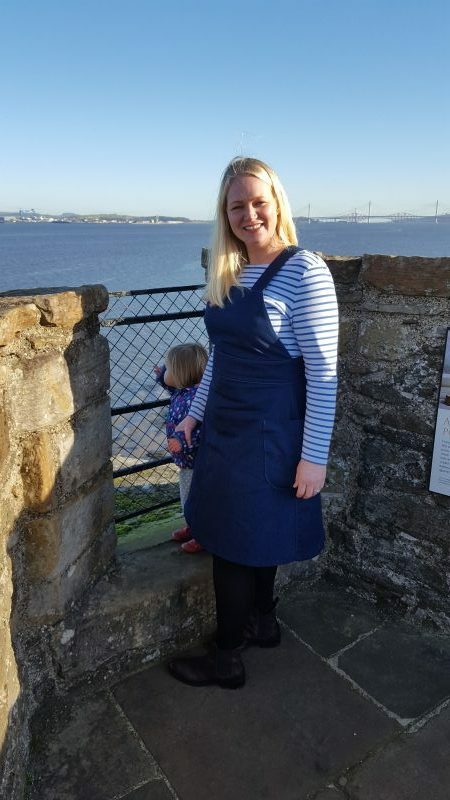 However if you truly wanted the dungaree dress look you could easily adapt this pattern to add buckles at the front. Personally, I like the clean lines of this pattern though. I did a mock up with a truly retro 1970’s bedsheet (one day will I be stoned for destroying such antiquities??). It showed that the front bib was gaping quite a lot at the sides and needed a bit of reworking. I did some fancy fiddling with the dart in a sort of full bust adjustment. It was a bit of a learning experience and I’m not sure I repeat it easily. For fabric I selected the 10oz Indigo Stretch Denim. It’s the kind of weight of denim that would be ace for jeans (jeans are on my challenge list for 2018) or a Grainline Moss skirt or a Tilly and the Buttons Delphine skirt. The indigo is a really nice deep colour and seems to hold its colour really well. Obviously I prewashed it, but I was worried that it might continue to leach colours since it’s such a deep blue. On previous adventures with denim I’ve sometimes ended up with a dirty hue to my fingers when I worked. Amazingly this denim holds its colour really well and I’ve been able to chuck it in the washing machine as normal which is ace. The joy of denim is it doesn’t move much when cutting and sewing. The pain of denim is the fraying. So before I started I overlocked all the edges of my pieces in contrasting red. As another contrast I used an aqua blue topstitch thread. The top stitching is optional but really makes this look professional in my view. All in all this pattern, with this fabric, was a joy to make. It took me roughly 3 hours of sewing time and that was probably just a bit slow because I only have 1 machine which means a lot of rethreading the machine to do the topstitching. And here is the finished product! I really really love it. 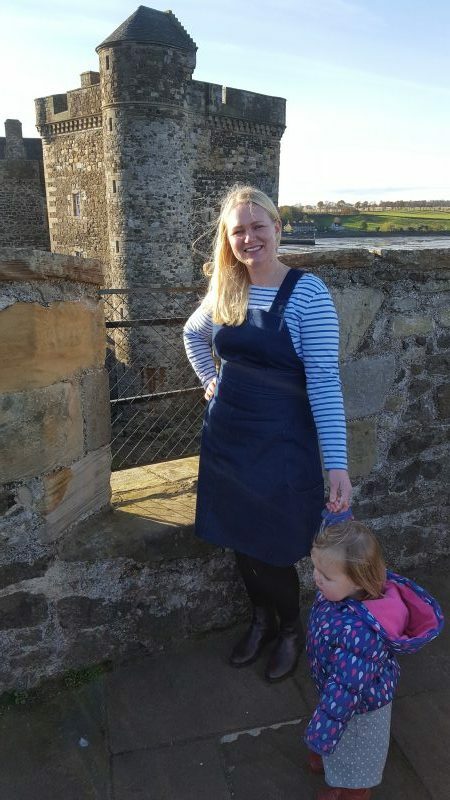 It’s a lovely versatile dress for me on my days off when I’m hanging out with my kids. And did I mention the pockets? They’re huge and deep and perfect for all my bits and bobs. I lined my pockets with the same fabric as the bib lining. The pattern doesn’t ask for it but I think it gives it a cleaner, more professional look. The pockets are so perfect in fact that when I travelled to Rome wearing my dress the pockets the perfect size for my passport and boarding pass. I did try to get a nice photo of me wearing my dress in Rome but had to give that up for lost after buying 2 umbrellas in 5 days and drying my shoes out with a hairdryer (turns out Rome in November is a tad bit wet). 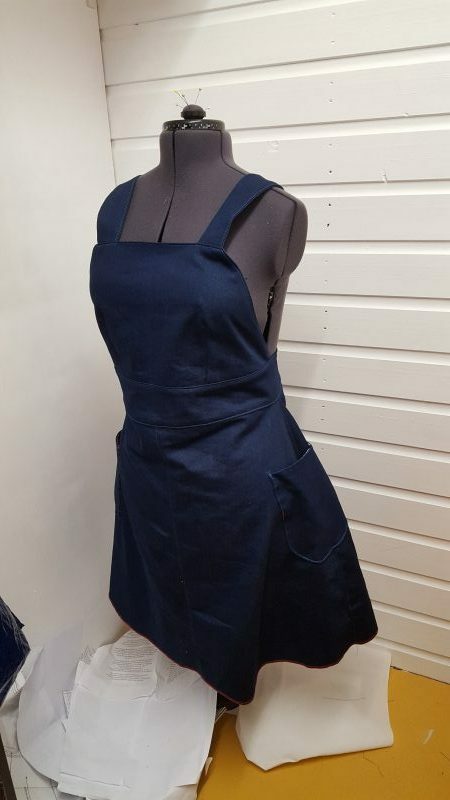 So for all you ladies who like the pinafore look but really prefer and more fitted silhouette I would highly recommend this. 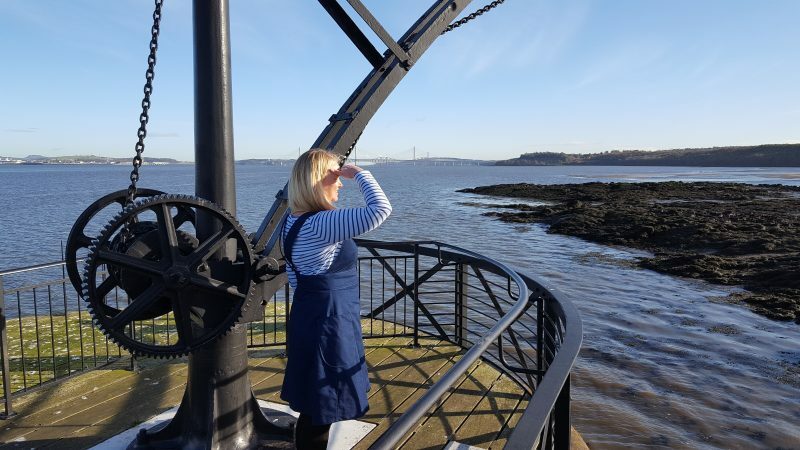 A denim pinafore is quickly going to become my signature look on days off from work. 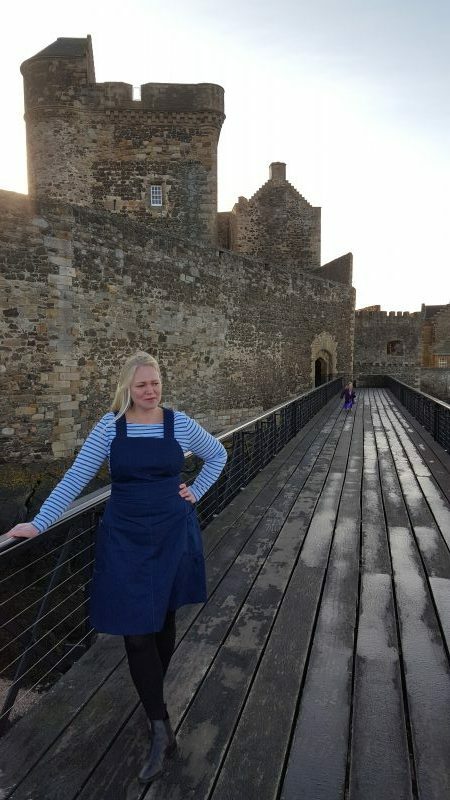 I cam across your review of my pinafore design for Simply Sewing, and have to say how proud I am to see this come to life. I do love the shape as it is so flattering,and you also have an instant A line skirt shape.